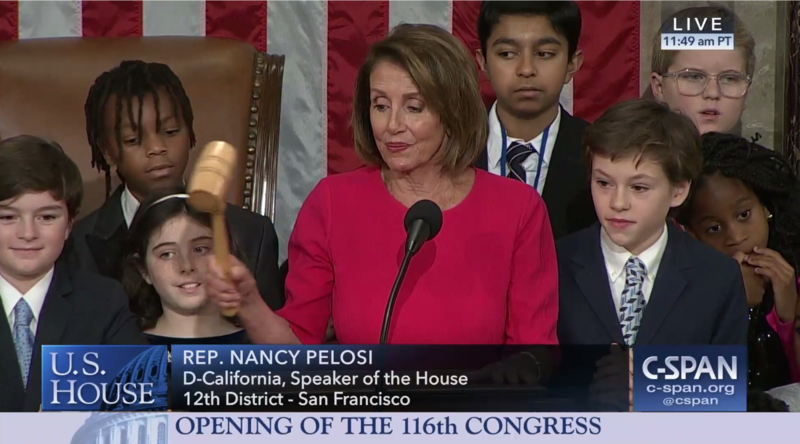 The 116th Congress is historic for several other reasons, not just because of a record number of women – 102 – comprising 23.4% of the Members of the House, 36 whom are new members, 3 of whom are openly gay. For example, the House Rules will now allow head coverings by Members on the floor – a first – which was done to accommodate the religious faith of some members – two Muslim women, the first two Muslim women ever to be elected to Congress – Democrat Rashida Tlaib, in Michigan’s 13th District, and Minnesota Democrat Ilhan Omar, from that state’s 5th District, one whom (Tlaib) is the first Palestinian-American woman to serve in Congress. Further, a record number of women of color – 43 – were elected to the House, including our nation’s FIRST two ever Native American women Members of Congress – Democrat Sharice Davids from Kansas’ 3rd District (also that state’s first openly gay Member of Congress), and Democrat Deb Haaland in New Mexico’s 1st District. Democrat Ayanna Pressley from the 7th District became the first black woman elected to Congress from Massachusetts. Democrat Abby Finkenauer from the 1st District, and Democrat Cindy Axne in the 3rd District became Iowa’s first two female Members of the House. Democrat Veronica Escobar, in Texas’ 16th District, and Democrat Sylvia Garcia, in the 29th District, will be the first Latinas elected to the House from Texas. And that number of diverse members includes a 29-year old woman, who is the youngest-ever Member of Congress – Democrat Alexandria Ocasio-Cortez from New York’s 14th District. TRULY, a momentous occasion on all counts! Oh… and they’re ALL Democrats! Numbers of Republican women in the House fell to 13 from 23, a decline of 56%. This entry was posted on Thursday, January 3, 2019 at 3:00 PM	and is filed under - Did they REALLY say that?, - Politics... that "dirty" little "game" that first begins in the home., - Read 'em and weep: The Daily News. Tagged: 116th Congress, Congress, Democrats, government, historic, House of Representatives, Nancy Pelosi, religion, Speaker of the House. You can follow any responses to this entry through the RSS 2.0 feed. You can leave a response, or trackback from your own site.